I'm so proud of Patti and her weight loss. She has really done well! In July of last year she had a Roux-en-Y gastric bypass and has done everything by the book according to her doctor's wishes. He is proud of her too. He even wants to post pictures of her on his website when he gets it going in the future. We promised that we would keep a photojournal of all of our progress. 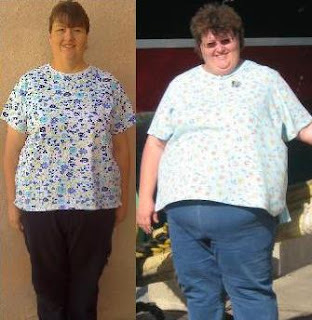 To date Patti has lost over 130 lbs. The Right side of the pictures are from when we went to Nassau in late June. The left side of the pictures were taken in early April. To help the porcess along, we have bought cruiser bicycles that we ride to work when the weather is favorable, and Patti is attending a line dance class. Time to go shopping - However Treb we need pictures of you too! Maliboomer - here we come Patti - get ready!